My Granddad served in the Pacific in World war II and while he was stationed there, he bought items from local artisans. Granddad didn’t buy the touristy cheap stuff. He went for the authentic and for a country boy from eastern Kentucky he had really good taste. 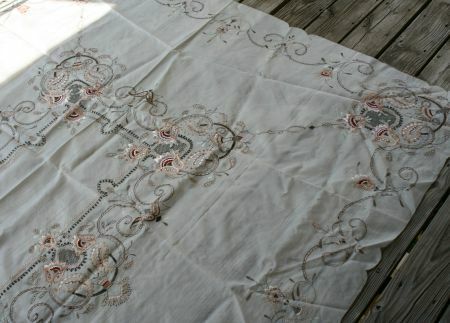 I have a few of the things he bought back in the late 1940’s and early 1950’s and one of those things is a hand embroidered tablecloth with matching napkins. On those napkins (all twelve of them) is the Forbidden Stitch. I’ve poured over the table cloth itself and it does not seem to have any Forbidden Stitches in it. But its AMAZING so I’m going to show you a bit of that too. And I say “a bit” because its so big that even standing on a chair with the wide angle camera lens, I can’t fit the whole thing into the frame. No I didn’t wash/steam out the folds. I make it a practice to barely touch this table cloth. I’ve never used it in my life and I keep it in the old pillow case it was in when my mother gave it to me. She never used it either. I betcha Grandma never used it. But we all loved it because its so beautiful. Too beautiful for people to eat on. Yeah Granddad had good taste. But back to that Forbidden Stitch. Why is it forbidden? The standard answer is that its so small and difficult to work that making this stitch causes the needle worker to go blind. Young girls loose thier eyesight when they make this stitch! I don’t buy that. Sorry. Not the part about fine needle work will make you go blind. 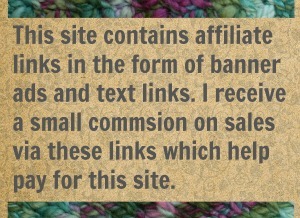 I totally believe that (beware the thread crochet!). But that any government in history cared about the welfare of young unmarried girls? That I don’t believe. So I went poking into the history of the Forbidden Stitch and most textile historians believe the name comes from the Forbidden City. The Emperors of China lived in the Forbidden City from the 1400’s until the 1900’s and they had hordes of needle workers making costumes and tapestries and table clothes and a zillion other things. The Forbidden Stitch was for the Emperor and his court and not for the rest of us mere mortals. It wasn’t supposed to leave the Forbidden City. But of course it did. Tell someone “this is not for you! Its forbidden!” and of course they have to have it. 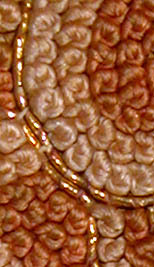 The medieval nobles of Europe loved this stitch and they were making a version of it under the name French Knot. Someone must have blabbed. A French Knot is basically the same as a Pekin Knot (aka Forbidden Stitch), only the thread is wrapped at least twice around the needle. So while needle workers inside the workrooms of the Forbidden City may have indeed been going slowly blind, it was forbidden because only special people were supposed to wear this stitch. In Europe it would have been called a sumpturay law, like the ones that made it illegal fro anyone but a prince to wear gold lace. In the Ming and Qing Dynasty of medieval China, important men wore embroidered badges on their chest. The more elaborate that badge was, the more important they were. Still, the “a young girl went blind making this” probably makes for an excellent sales pitch. I’m sure Granddad believed it and forked out quite a few bucks thinking he was buying his wife an outlaw table cloth. And I thank him for that. Its quite the family heirloom. 10 Comments on "What Made the Forbidden Stitch so Forbidden"
Are the embroidery motifs for this extraordinary cloth European imports to Asia? generations, that I know of. My Mother always wrapped them in new blue tissue paper every year. I have not done this. Should I?????????? I would not know if those motifs were imported. I’m not good at all with tracking/recognizing stitch motifs. Maybe someone else will jump in and answer. 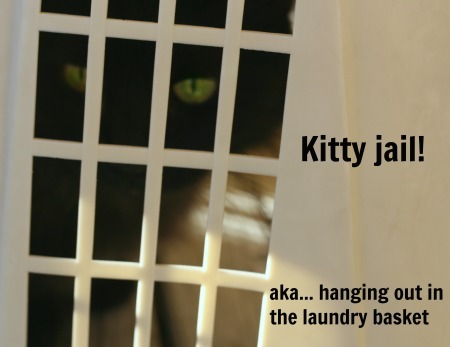 As for the care of old fabrics, if you use tissue paper be sure its acid free. Then its okay. Toss in some bug repellent too like cedar or lavender. Or both. Since the tablecloth is from the 40’s to early 50’s and the British had been in China since way before the Boxer Rebellion, I’d guess the motifs were imported in the interests of trade. 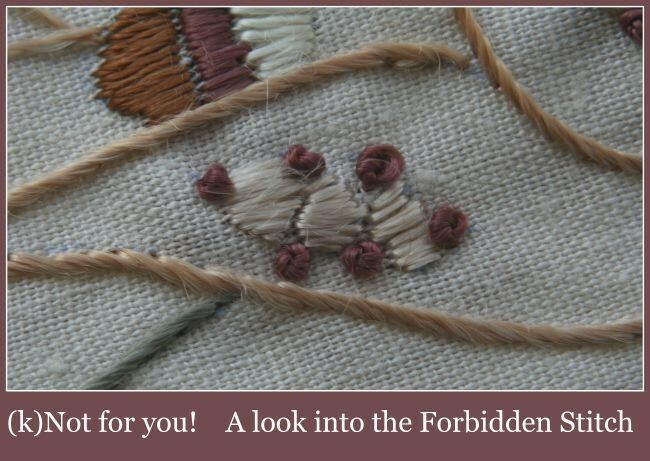 And here I was thinking the forbidden stitch was because it made the embroiderer swear like a sailor! 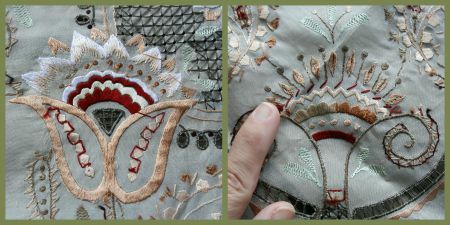 I love textiles with a good story! Me too. Love textile history. How well I remember the scoldings I received when I dribbled gravy or Cranberry!!! on Grandmother’s table cloth. Banished to the children’s table for another year! I sympathize with your Grandmother. As a dribbler of food (I can’t seem to help it) I never let myself near a nice table cloth. I’ll stick with the kids at the kiddie table.